The unit is powered by 8 x 1.2v cells (regular AA batteries) and offers low speed fluid delivery for a gentle lavage at 200 l/min-1 and a high speed setting, offering a hugely powerful cleaning action of 1000 l/min-1. 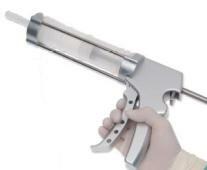 There are independent fluid and suction tubes and a textured barrel and handle for a secure and comfortable grip. View the brochure. The SmartPulse II™ provides effective wound debridement following orthopaedic procedures in trauma and joint arthroplasty. 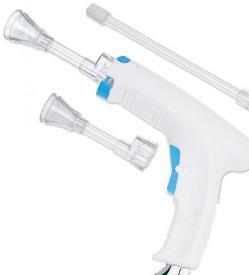 Like the SmartPulse ™ it is also a versatile and light weight single-use system supplied in a double sterile pack. The unit comes complete with a 35 mm diameter cone tip, however additional 50 mm and 70 mm tips are available in our add on pack which can be purchased separately. The unit is powered by 8 x 1.2v cells (regular AA batteries) and offers variable speed fluid delivery. View the brochure. The Mixocem™ System is a simple and efficient bone cement mixing system which does not require a vacuum and therefore allows surgical teams greater freedom to concentrate on more complex operational procedures. Clinical observations have revealed that vacuum mixing of bone cement improves mid and long-term survival rates of total joint replacement1 and that, in comparison with hand-mixing, vacuum mixing significantly increases the tensile fatigue strength of bone cement2. It is a closed system which eliminates the need to mix the cement separately with it mixed in the applicator cartridge by a paddle, mixing the cement to a perfect consistency. View the brochure. Perfectly used in conjunction with our Mixocem™ System, our Bone Cement offers convenient mixing characteristics and excellent mechanical properties. 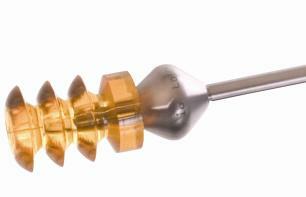 It fills the free space between prosthesis and the bone and allows for immediate and stable fixation of an implant. Manufactured in 4 varieties with different viscosity, PR1 and PR1G are standard viscosity cements for manual use and PR3 and PR3G are low viscosity for syringe use. The 'G' denotes the content of the antibiotic Gentamicin. View the brochure. Adequate cement filling has proven to be essential to the success of long-term joint replacement 3 4, Bioplugs™ perform this vital function. They are resorbable bone cement plugs or cement restrictors which seal the medullary canal, thus enabling optimal cementing of a prosthesis. The conical insertion hole eliminates any traction force on the plug when the instrument is withdrawn and the innovative instrument set allows the user to measure the femoral canal and to insert the plug with the same device. Available in 8,10,12,14,16 and 18 mm sizes. View the brochure. 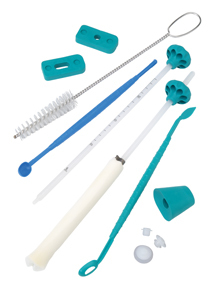 Orthopaedic Innovation Limited's Femoral Preparation Kit has been developed to simplify the process of preparing the femoral canal ready for the cementation and placement of the chosen implant. The kit, which is supplied sterile, contains instruments designed to clear bone and tissue debris as well as remove excess blood, fluid and cement. The instruments are: 1 Femoral Canal Suction Absorber (19 mm), 1 Femoral Canal Brush (19 mm), 1 Femoral Restrictor Inserter, 3 Femoral Cement Restrictors (15 mm, 18 mm, 24 mm), 2 Curettes, 1 Femoral Cement Pressuriser and 2 Digital Pressurisers. View the brochure. Orthopaedic Innovation Limited's Femoral and Acetabular brushes have been designed to remove fibro-cartilaginous and granulation tissue, bone and cement fragments before scouring the surface to enhance fixation at the bone interface. Both the femoral and acetabular brushes are supplied sterile, in boxes of 10 or 100. View the brochure. 1 Breusch, S.J. et al. “The Well-Cemented Total Hip Arthroplasty: Theory and Practice”. Springer Hardback. 2005, XIV, 378, p.502. 2 Jiranek, W.A. et al. “Antibiotic-Loaded Bone Cement for Infection Prophylaxis in Total Joint Replacement”. The Journal of Bone and Joint Surgery (American). 2006:88:2847-2500. 3 Klapach, S. et al. “Charnley Total Hip Artroplasty with Use of Improved Cementing Techniques. A Minimum Twenty-Year Follow-Up Study”. The Journal of Bone and Joint Surgery. 83:1840-1843 (2001). 4 Ilizaliturri, V.M. et al. “Plug Migration and Cement Mantle Assessment in Total Hip Replacement”. Internation Orthopaedics. Vol. 28, Number 1, 11-15 (2004).